January 29 1921, Edwin and Emelia Phillips welcomed another baby girl in their family but at the time, no one had any idea of the extraordinary life that she would go on to lead. 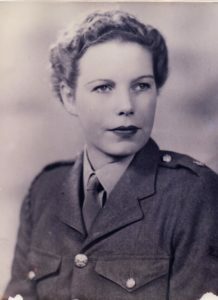 She would travel the world, join the army, emigrate halfway across the globe and survive a direct bombing by German forces in the second world war. At 97, Hilda May Fletcher, has seen and experienced enough love, loss and adventure for two lifetimes but finds herself with a wonderful legacy and one incredible life story. Raised in Staines, Middlesex in the United Kingdom during the lead up to The Great Depression and World War II, the Phillips family struggled to make ends meet when Edwin came home after serving in the first world war. They shared a three bedroom house with another family, Mr and Mrs Currier and their six children for several years. “When dad came back after the war, of course I wasn’t born then, but he had trouble finding work. So he and his army mate decided to share a house. They had the bedroom and the box room upstairs, as it was called, because Mrs Currier had more children and we shared the front room. We had two double beds, right next to each other. Me, Dot and Ida in one and dad, mum and Edwin, who we called Sonny, in the other,” she explains from the her sitting room in Mudgeeraba, Gold Coast. These memories and experiences are ones that seem so foreign to your average modern Australian. Most us grew up in our own bedrooms, with hot water available all the time and of course, our modern appliances and technology. Listening to such recollections sounds like a BBC period drama come to life. Though, despite not having a lot and struggling to get by at times, Hilda only remembers her childhood with fondness. She explains that whilst they never went hungry, they didn’t often have access to many different foods. Delicacies such as oranges were reserved for special events such as Christmas and birthdays. The Phillips family lived in the shared house with The Curriers until Hilda’s maternal grandfather managed to obtain the family a council house at 71 Dalleygreen Road, Egham, Surrey when she was about six years old. Hilda attended an all girls school near her Aunt’s house in Thorpe until she was fourteen, which was the usual age to leave school for working class girls in 1935. She continued to live in the family home and worked at a few different jobs, such as in a button shop and a newsagency before the war started. She spent her downtime going to the pictures with friends, dancing with dapper young men at the town hall on Saturday nights and shopping along one of many London High streets until 1st September 1939 when Prime Minster Winston Churchill announced that England would not sit idly by as Europe was once again plunged into warfare.